As a wedding ceremony officiant in the Hudson Valley for over 20 years, I thought it might be helpful to share an insider’s view of some of the best wedding ceremony sites in the beautiful Hudson Valley. As it turns out, about 95 percent of couples are having their wedding ceremonies on site at their reception locations. So, I interviewed the owners and wedding managers at five of my favorite locations. In Part 1 of this article, I’ll give you a look at each of them with links to their websites and contact information. In Part 2 next week, I’ll summarize the inside scoop I gathered from the following five fabulous venues. 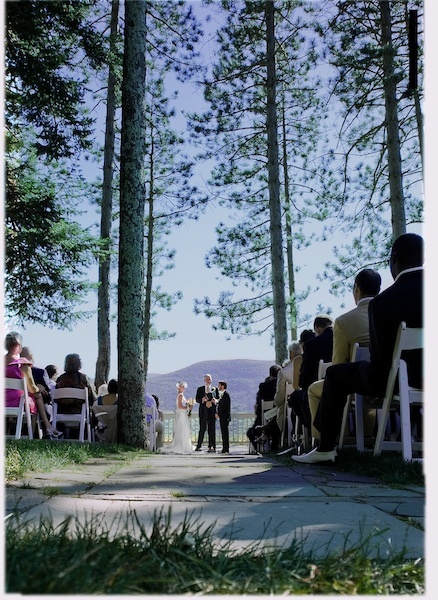 Onteora, located 100 miles north of New York City in the heart of the Catskill State Park, is available for weddings from May to October. They host about 30 weddings each year with an average size of 120 guests and a maximum of 200. Almost all couples who marry here come from the New York City area to have a weekend destination wedding with exclusive use of the facilities, including seven guest rooms, surrounded by family and friends in this private, sophisticated enclave overlooking the breathtaking Esopus Valley. 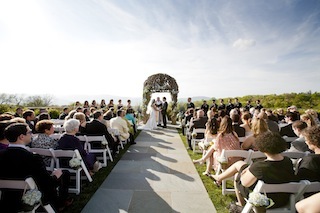 Outdoor ceremonies typically take place on the 90-foot deck overlooking the majesty of the mountains. A new indoor dining room with ceiling to floor windows is the perfect setting for indoor ceremonies. 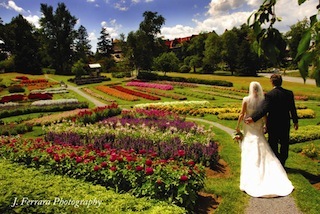 Christina has overseen the weddings at Mohonk for over 17 years now. She describes Mohonk as “the most magical place in the Hudson Valley to have a wedding.” To say Mohonk is unique is an understatement — this legendary Victorian castle built in 1869 on spectacular cliffs above Lake Mohonk is a mountaintop resort just 90 miles north of New York City. It offers 259 guest rooms, awe-inspiring views and encounters with nature’s beauty, a family-friendly atmosphere, and an award-winning spa. About half of the 60-70 couples who choose Mohonk for their weddings each year have some tie to the thousands of acres of pristine forest and winding trails it offers. Many have hiked in the area or their families have visited Mohonk for generations. Others are delighted to discover Mohonk for the first time. Vow renewal ceremonies and anniversary celebrations offer another special way to bring family and friends together as the centerpiece of a family reunion. An estimated 60 percent live in the tri-state area — many from New York City. The Garrison hosts about 80 weddings each year. Ninety percent of the couples who wed at the Garrison live in the New York City area. One groom commented that he “always wanted to get married here because it’s like looking out on a beautiful mural that God made.” An hour north of Manhattan, the Garrison’s 300 stunning acres offer a spectacular countryside retreat with critically-acclaimed cuisine, impeccable service, Hudson River and mountain views, and sophisticated elegance in a natural setting. The Garrison has an “eat local philosophy” — serving local, organic meats, vegetables, and herbs. Most outdoor weddings take place under the pergola in the Ceremony Garden. Constructed of carefully inter-woven bittersweet vines, the pergola can be left natural or decorated with flowers and greenery. The north-westerly facing garden frequently has unforgettable sunsets. Most indoor ceremonies are now in the new Hudson Room, designed by Sharon Davis Design Studio and offering a panoramic 360-degree view that brings the outdoors inside. Nikola characterizes the Belvedere as “a boutique hotel with great, authentic European food and an intimate setting on a totally private estate.” They offer three outdoor ceremony locations as well as an indoor option. Small ceremonies often take place in Belvedere’s original Stanford White designed gazebo. Larger gatherings of 200-250 often choose a site along the pond, but 90 percent of Belvedere ceremonies are mid-sized and take place behind a gate in a lovely French Garden. Indoor ceremony options are also available. Interviewees: Tom Struzzieri, owner and Laurie Hicinbothem, the Event Sales Manager. Diamond Mills, a member of the Small Luxury Hotels Network, is a boutique hotel and tavern located along the beautiful Esopus Falls, which used to provide power for many Saugerties businesses. It can now be enjoyed from the private balconies of the hotel’s 30 guest rooms and as the backdrop for two of the facility’s ceremony site options — even in inclement weather when a protective tent can be used. Indoor ceremony locations include the hotel’s grand hallway with a majestic staircase or one of the ballrooms. Reputed to have a “Soho in Saugerties feel,” Diamond Mills is one of the Hudson Valley’s newest wedding locations and is just now entering its second season. With 30+ weddings booked to-date for 2013, they are already booking into 2014 and beyond. About half of the couples who have their weddings here come from the New York City area, while the other half come from Dutchess, Ulster, and Greene counties. Though their Grand Ballroom can accommodate up to 400 guests for dinner, their average wedding includes an average of 145 guests. The only problem with these venues is that you have to pick only one! If you have any questions for me about these locations, feel free to email me or leave your comments below and share your thoughts. There are more wonderful venues in the Hudson Valley as well which I will cover in future articles. 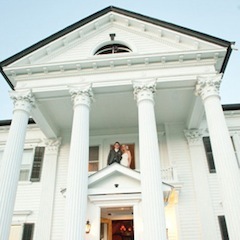 There are so many beautiful wedding locations in the Hudson Valley to choose from. Come and enjoy our bounty, beauty, and wonderful people.